A look at Tesla’s new…cabin filter? If you are often stuck behind smelly diesel trucks on your morning commute, Tesla has got you covered. The American automaker made headlines when it revealed a “Bioweapon Defense Mode” on its Model X SUV last year. Now, in an attempt to prove the feature isn’t just marketing kitsch, Tesla released an in-depth look at the filtration system. According to Tesla, health risks from air pollution are “statistically” more hazardous than automotive collisions, because they lead to so many adverse health effects, so the automaker began work on the “high-efficiency particulate air” (HEPA) filter for Model X. The filter cleanses the incoming air of any pollen, bacteria, and pollution before they even enter the cabin air, as well as cleaning air that’s already circulating within the car. To demonstrate this technology, Tesla sealed a Model X in a controlled environment, and introduced “extreme” levels of pollution, far beyond the EPA’s suggested limit of human consumption. 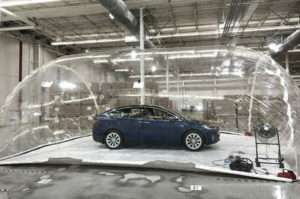 The Model X filtered the air down to undetectable levels within two minutes, allowing the participants to remove their gas masks in the Model X — while the outside of the car was still surrounded by dangerous air. Seem like a ridiculous feature? It shouldn’t. While buyers in the U.S. might not see this as anything short of a gimmick despite the capability, potential buyers in China wouldn’t be so quick to dismiss the feature. In a country where air pollution is so severe, some inhabitants will purchase cans of clean air, this feature could be a big selling point for Tesla shoppers. Take a look at Tesla’s new Bioweapon Defense Mode in the brief video below.